Kofi Annan is in the middle of his last UN General Assembly session as Secretary General. He must stand down by the end of the year, and the race to succeed him is gathering pace. Six people are in the running, but it is possible that Mr Annan's successor will not be among them. There is still time for others to throw their hats into the ring. Traditionally, the UN Security Council recommends a candidate and the 192-member General Assembly approves the choice. Below are portraits of the six candidates. Ashraf Ghani, a former finance minister in the Afghan government, is an expert on the economies of developing nations and post-conflict reconstruction. Focus on poverty eradication through creation of wealth and rights of citizenship have been at the heart of his developmental approach. He has worked as an adviser to the United Nations and on World Bank projects in China, India and Russia, among others. Mr Ghani, 57, holds a doctorate from Columbia University in the US, and has taught at some of the leading US universities. 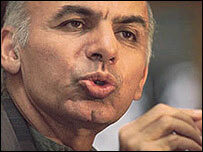 He returned to Afghanistan in 2002 to serve as finance minister in the US-backed government of President Hamid Karzai. In the two and a half years that he held the post, he secured international aid pledges worth more than $28bn. He also carried out a series of extensive reforms. After Mr Karzai won the 2004 election, he asked to leave the government and was made chancellor of Kabul University. He has extensive media experience as a commentator. He told London's Financial Times newspaper recently that he was counting on the strength of his ideas to win the post. "In the public debate so far, I have yet to see a clear articulation of vision, an analysis of the central issues and a programme for change," he said. South Korea's Minister of Foreign Affairs and Trade Ban Ki-moon has emerged as a front-runner in the race to succeed Kofi Annan. In an informal straw poll held in July among the 15 members of the UN Security Council, he came out top. 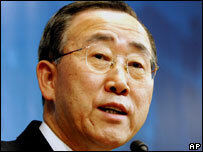 A career diplomat, Mr Ban, 62, has previously served at South Korea's UN mission and its embassy in Washington. He has also been his country's ambassador to Austria. As South Korean foreign minister since January 2004, he has played a leading role in six-nation talks aimed at ending North Korea's nuclear ambitions. According to the ministerial website, his "guiding vision has been that of a peaceful Korean peninsula, playing an expanding role for peace and prosperity in the region and the world". Having declared he would stand in February, Mr Ban has had seven months in which to garner support. Announcing his candidacy, South Korea's vice-foreign minister Yu Myung-hwan talked of Mr Ban's "immaculate reputation" during nearly four decades as a diplomat and administrator. "He has long been involved in issues of peace and security, development, democracy and human rights - the necessary qualifications to accomplish the UN's ideals and goals," Mr Yu said. The government, while backing Mr Ban, has tried to keep its campaign low-key since early favourites have traditionally been overtaken in the later stages. He may face criticism from some quarters over his country's non-committal approach to North Korea's human rights record, which has seen South Korea abstain in UN votes on the issue. Mr Ban graduated from the Department of International Relations at Seoul University in 1970 and has a masters degree in public administration from Harvard University. Prince Zeid al-Hussein, Jordan's UN ambassador, is a widely respected diplomat. If chosen to succeed Kofi Annan, the 42-year-old former UN peacekeeper and cousin of King Abdullah II would be the first Muslim to head the world body. He was recently quoted by the Associated Press as saying that there was "considerable scope to be given by the Security Council and the General Assembly to a Muslim who was familiar with the UN but not of the UN". There is an understanding that the next secretary general should come from Asia, as part of a tradition to rotate the job between regions. Although technically Jordan is part of the Asian group at the UN, some countries might consider it more Middle East than Asia when it comes to choosing Mr Annan's successor. 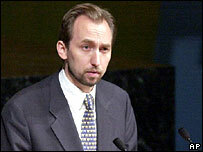 Educated at Cambridge in the UK and in the US, Prince Zeid is an expert in the field of international justice. He played a key role in setting up the International Criminal Court in The Hague, the world's first permanent war crimes tribunal. He has also spent more than a decade focusing on peacekeeping issues at the UN. Between 1994 and 1996, he was political affairs officer at the peacekeeping mission in the former Yugoslavia. In 1997, he was the first diplomat publicly to demand a UN report on the 1995 massacre of thousands of Muslim men and boys at Srebrenica. This eventually culminated in a report by Kofi Annan on the failures to protect civilians. In mid-2004, he was named by Mr Annan to oversee an inquiry into allegations of abuse and sexual exploitation by UN peacekeepers in missions from Bosnia and Kosovo to Cambodia, East Timor, West Africa and Congo. His report outlining a strategy to combat such abuse, was endorsed by world leaders at the 2005 UN Millennium Summit. Thailand's Deputy Prime Minister Surakiart Sathirathai has the official backing of all 10 nations in Asia's regional bloc, the Association of Southeast Asian Nations (Asean). Aged 48, he has already notched up terms as foreign minister and his country's youngest ever finance minister. The first Thai to earn a doctorate in law from Harvard University, he served as dean of the law faculty at Chulalongkorn University in Bangkok for several years, specialising in international law and development. He also has private sector experience as chairman of a commercial bank and has overseen the privatisation of major Thai enterprises. Mr Surakiart has said he is ready to take difficult decisions on reform and believes in multilateralism. However, some observers believe he may have started his campaign for the UN's top job too early. He came third of four declared candidates in an informal straw poll conducted in July by the 15 members of the UN Security Council. A Hong Kong-based human rights group, the Asian Human Rights Commission, criticised Mr Surakiart last month for his failure to influence Burma's military regime while foreign minister. 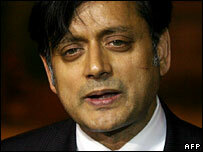 India's Shashi Tharoor is a career UN diplomat, having worked in the world body for nearly three decades. The 50-year-old under secretary-general for communications and public information in the UN is said to be eloquent and excellent at public diplomacy. In the July straw polls, held at the Security Council, Mr Tharoor, who is close to Kofi Annan, polled the second highest. Born in London and educated in India and the US, he worked first with the UN High Commission for Refugees (UNHCR) and then oversaw peacekeeping in the former Yugoslavia. In recent interview with the BBC, Mr Tharoor said he believed passionately in the UN and saw it "as a force that can make a real difference in the world". Speaking at the Center for Strategic and International Studies (CSIS) in Washington in early September, he said that if he were elected, he would focus speeding up the deployment of UN peacekeepers to conflict areas as part of UN reforms. "One manifest problem is speed of deployment," he said. "We simply don't get our soldiers (into conflict areas) quickly enough." He says that if chosen, he would also seek to heal divisions between wealthy and developing countries over reform of the world organisation. But some commentators have said that Mr Tharoor's experience may count against him. Some say that a senior insider may not be the person to deliver the radical reforms that they believe the organisation needs. Mr Tharoor is also a prize-winning author. His political satire The Great Indian Novel focuses on India's struggle for independence. President Vaira Vike-Freiberga has led Latvia since 1999. She has been working for over a year as Kofi Annan's special envoy for United Nations reforms. The popular Baltic leader is a strong supporter of the US policy in Iraq and is believed to enjoy the support of the White House and certain EU countries. However, few diplomats believe the 68-year-old will succeed Mr Annan as it is thought that the next secretary-general will most likely come from Asia. This is part of a tradition to rotate the job between regions. After declaring her candidacy, she called on the world to take seriously a woman candidate. "Half of humankind has never been represented at the helm of the UN," she said in her speech launching her candidacy. She also argued for more openness in the process of selecting a successor. "I think that too many women in too many ways have allowed themselves to be discouraged by the knowledge that there are all-boys clubs operating, that the boys get together, that they make deals," she said at a press conference in New York in September. The former psychology professor has had a meteoric rise in politics. Ms Vike-Freiberga was raised in Canada, where she enjoyed a distinguished academic career. She specialises in the relationship between thought and language. In 1998, she received an invitation to head the new Latvian Institute, established to raise the profile of Latvia and the Latvians around the world. 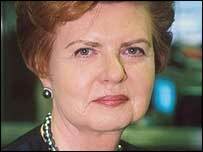 Shortly afterwards, she returned to Latvia and was elected president within a year. At the time, Latvia was facing many problems in its efforts to build a Western-style democracy and market economy. She is now on her second, four-year term as head of state. Sri Lankan diplomat Jayantha Dhanapala withdrew from the race at the end of September after faring poorly in three informal polls held by the Security Council.